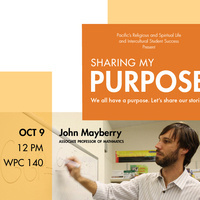 Join us for the second "Sharing My Purpose" event with guest speaker Professor John Mayberry, Associate Professor of mathematics. Every second Tuesday of the month at noon in WPC 140, a Pacifican will share how their passions, various identities and life events helped them discover their purpose. Join us for this opportunity of inspiration and self-discovery, and learn more about Pacific students, staff, faculty and alumni. If you need reasonable accommodations to participate in this event, you are asked to email religiouslife@pacific.edu or call 209.946.2538 at least three business days in advance.